With all the focus on the oil spill over the last few weeks, and my usual Sunday posts relating to coal at the moment, I am taking time for a short break with a change in topic. 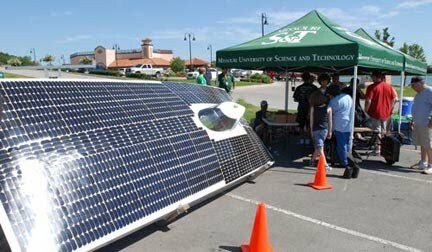 Today the solar car race starts its way across the country. With cars in the race that can now exceed speeds of 105 mph the race each day may be a little shorter than it used to, when cars limped along at 15 mph and similar slower speeds. The 2010 American Solar Challenge (ASC2010) is a competition to design, build, and drive solar-powered cars in a cross-country time/distance rally event. 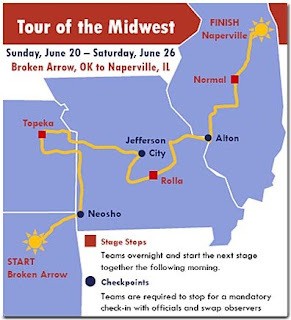 Teams compete in a 1100 mile drive from Broken Arrow, OK to Naperville, IL. The route has been chosen to combine pieces of old routes used in previous events, giving a bit of an historical tribute for the 20 years of organized events in North America. 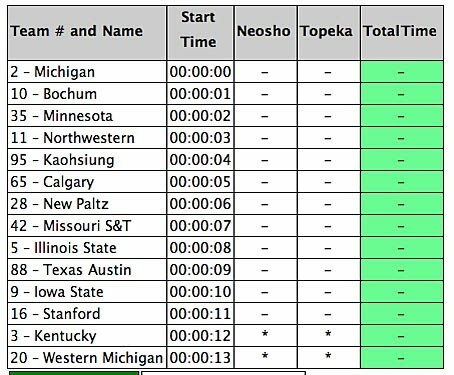 UPDATE: I have put the times for the first 10 cars to arrive in Neosho according to the U of Michigan. The cars had to wait an hour there, and then drove on with Michigan now parked for the evening near Topeka. Kaohsiung is not far behind them, with the next block of cars parked for the evening near Butler, MO. The rules for the race are that the cars have solar panels covering the car, and batteries inside the car, so that they can continue driving through clouds and rain. This can require considerable strategy since a period without much sun can leave the car stranded by the roadside until it is either towed into the finish line, or the sun comes out and the batteries recharge. Adjusting speed to keep going through those outages becomes critical to overall success, if the race is run under bad weather. (Which it was one year, Rolla won that one). If the car finishes the route for the day early it can recharge its batteries while waiting for other cars to catch up, within specified hours. The race has great camaraderie and teams have been known to lend their competitors parts to keep them in the race. Since I will likely be trying to find out what is happening most of this afternoon, there will not be a coal post today – I’ll restart them after the race is over (it ends Saturday). There is some family interest in this given that the Engineer is supporting Northwestern and I reckon that the Missouri team will, again, show their quality in the end. Prior to the race there was a Grand Prix, down in Cresson Texas. FSGP is a track race, which also serves as a qualifier for the road race. The top teams in FSGP, which complete at least 100 laps in a single day, or any two consecutive day total of 150 laps, will automatically qualify for ASC. Only Official Laps will count towards qualifying mileage. The track is 1.7 miles. In addition, each solar car driver must complete a minimum of 25 laps of driving during FSGP to qualify to drive in ASC. The order of the race was set as a result of the Grand PRix, with the fastest lap times being set by Stanford and Minnesota, who tied with a time of 2.05 minutes for the 1.7 mile course. Because of the tightness of some of the designs, the race has its share of dramatic moments. Kentucky had a front wheel spindle shear, Oregon had electrical problems that couldn't be fixed, but those on the Western Michigan car were. (As was Missouri's parking brake problem). I believe that they had to stop racing at 5 pm. But could recharge the batteries until 8 pm. The top 4 cars are fairly close in time, leading to a potentially tight race. I wish I could get excited about solar powered cars. They have been doing the same strained design for decades. I can't think of a study that has less profitable or usable worth. As a fun thing to do, yeah it has merit.